Archana Devi was married off at the age of fourteen, like many of the girls in villages in those days. 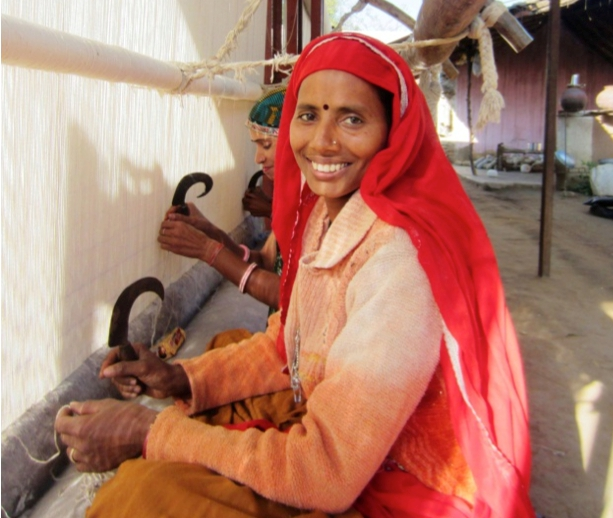 A well determined woman, Archana has not been to school but has the skills to fulfilling all her family’s daily needs thanks to the income she earns as weaver at Women on Wings’ partner Jaipur Rugs. Archana joined the Jaipur Rugs Alternate Education Program which provides functional literacy to illiterate artisans and village community members who were not able to complete primary education. The ambit of this ‘alternative education’ is basic literacy and numeracy skills, and developing an understanding of health, hygiene, family life, education and the environment while building their confidence so that they become more self-reliant in applying their learning in multifarious ways. Today Archana can read the newspaper, perform her signatures and use a mobile phone. Weaving came out a lifesaving opportunity for her, her children and her family. Empowering women is a well-proven strategy for improving children’s well-being. In fact, rural women’s economic empowerment can help reduce the number of underweight children. Putting more income in the hands of women, translates into improved child nutrition, health and education. An extra year of primary school increases girls’ eventual wages by 10-20 percent and encourages girls to resist child marriage. One extra year of primary school makes girls less likely to experience violence. They will also have fewer children.